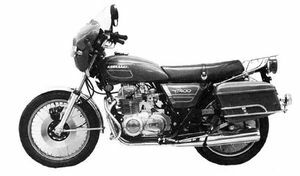 The Kawasaki KZ400A was a Kawasaki motorcycle produced by Kawasaki from 1977 to 1978 and more commonly known as the KZ400 Deluxe. Remarks: Modified KZ400D. Features fairing, saddlebags, luggage rack, and different painting. This page was last edited on 26 August 2010, at 18:19.